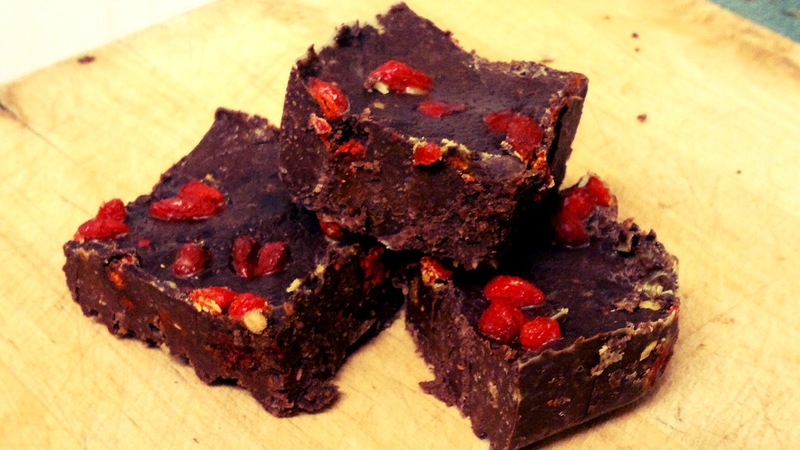 Superfood and fudge; not two words you normally hear in the same sentence... until now! You might have guessed by now that I love playing with recipes and ingredients to give unhealthy delights a healthy make over. Well the queen of healthy dessert makeovers is Chocolate Covered Katie and it was her fudge recipe which inspired this one. While the word "superfood" doesn't really have an exact definition and is more of a marketing buzz word, I still think these ingredients deserve superfood status! 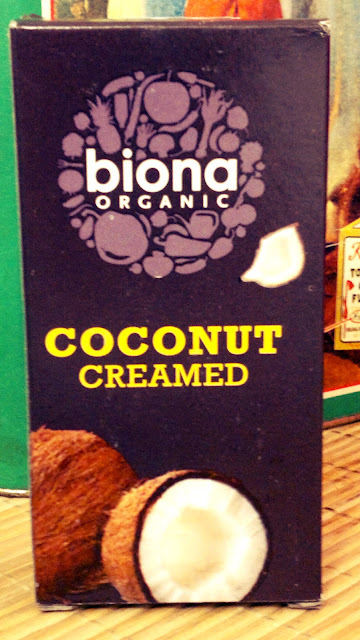 Coconut: contains anti fungal properties, stabilizes blood sugar, contains medium chain fatty acids which are more easily burned off and therefore can assist with weight loss. Raw cacao: is the highest antioxidant food on the planet, improves cardiovascular health, elevates your mood and energy, increases longevity. Goji Berries: used in Chinese medicine for over 5000 years, contains 18 kinds of amino acids, bursting with antioxidants, iron and B and E vitamins. Hemp Seeds: high in protein, contains all 9 essential amino acids, high in iron. Stevia: zero calorie, all natural plant based sweetener which stabilizes blood sugar levels. 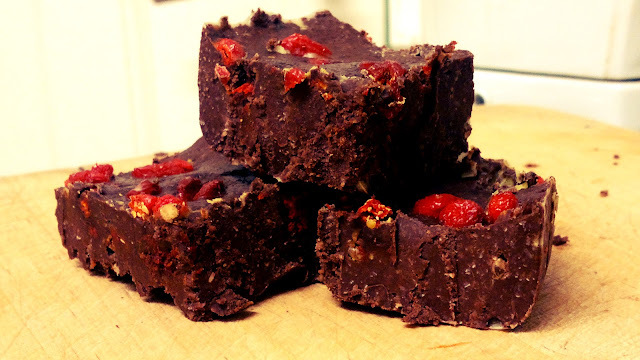 Chocolate-y fudge-y goodness with crunchy hemp seeds and bursts of goji berry sweetness. UPDATE: Recently I have been using 1/4 and a bit of avocado instead of apple puree. I think the texture and taste is much better! Melt coconut over very low heat. Keep your eye on it and stir often as it can burn easily. In a food processor, blend melted coconut, apple puree, raw cacao and stevia until combined. Add the goji berries and hemp seeds and gently pulse until combined throughout the fudge. 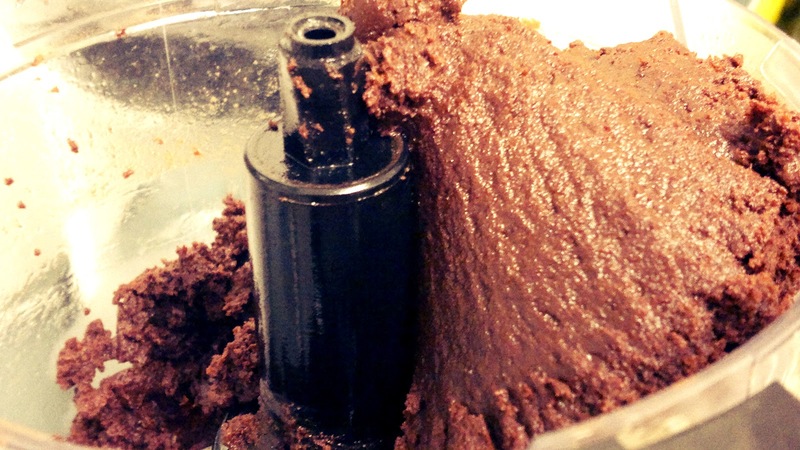 Scoop the fudge out of the food processor into a Tupperware container and firmly push it down. It doesn't matter what size you use, it will only change the height of your fudge. I used a square 5" container. You could also press it into different shaped molds. Place in the fridge to set for an hour or so. If you don't want to wait that long you can put it in the freezer for just 10 minutes and it will be ready. This is the creamed coconut I used, most varieties come in a box like this one. Oh, yummy! This fudge caught my eye at Wellness Weekends. Sounds so delicious!